Just started university, new job or just moved out? It’s hard to work out how to call your new place ‘home’. So what better way than to spruce up your new living space than with some fresh flowers. Delivered through your letterbox. And, they won’t even get squashed. We recently tried out Bloom and Wild’s range, and they’re so easy to display – creating a gorgeous focal point for any room. 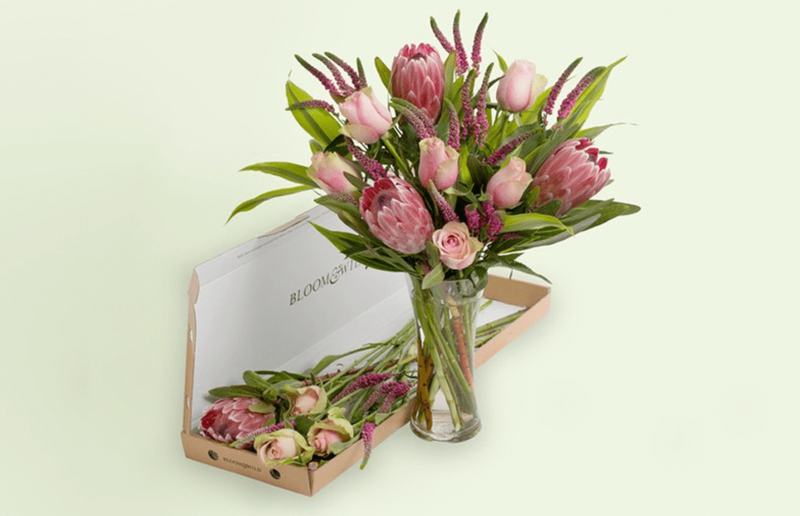 Selecting The Suki range which comes in at £30, the ‘tropical’ bouquet is filled with protea, bella roses and spray veronica. Arriving in a slick, thin cardboard box. I was at first concerned the flowers must be crushed inside. However as I pulled open the box the clever innovation made sense. Each rose inside was wrapped in a thin netting, to protect the petals, whilst the stems were neatly laid across each other. The bouquet is snugly kept together and the flowers fit perfectly through any letter box, which is something you cannot say about most collections. Imagine trying to put a full bouquet through a tiny slit in a door?! 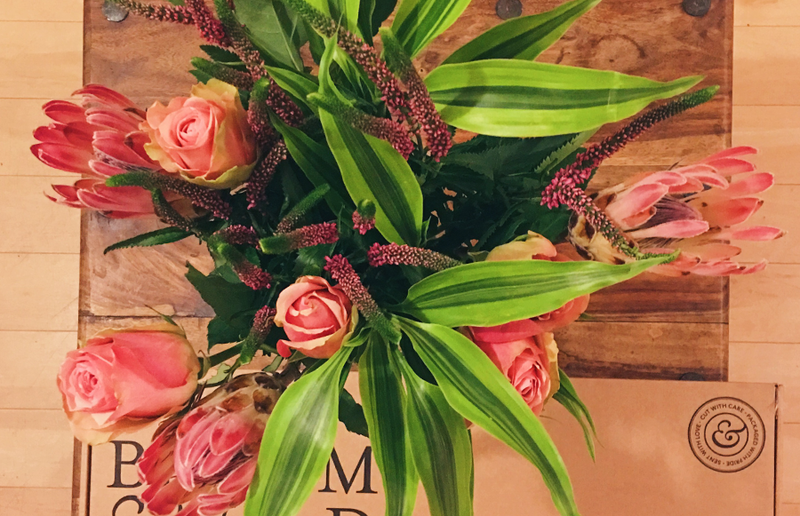 In our ever manic day to day, it’s nice to be able to just say hello to a friend, or thank you without having to worry about expensive courier services and still get someone fresh, gorgeous smelling flowers. Once I picked up the layers of fresh cut roses, I realised the mix of leaves and flowers I had received, and set about displaying them in a vase. It sounds silly but the fun of making the flower display yourself is quite enjoyable, and therapeutic. I cut some of the roses slightly shorter, and began placing the additional leaves into the water. The insert of the box also have instructions on how to look after your flowers, as well as providing some plant food to add to the water. After a couple of moments my masterpiece was complete – and so simply too. The flowers stayed fresh for around 7 days, and even after only slowly began to wilt. Changing the water regularly is a top tip to keep your flowers fresher for longer. It may sound like an unnecessary expense but flowers can really brighten any room. Whether you’re in a dingy student accommodation dorm, or a flat which doesn’t seem anything like mum and dad’s house… It really does add something special. Everyone loves flowers. Guys love flowers, girls love flowers. Your lecturer who is marking your paper who wrote the night before will probably love flowers. Also, if you want some ideas for using the flowers other than just putting them on display why not be the envy of every fresher with a flower crown? Yeah. Lana Del Rey eat your heart out. We’ve dropped the link below if you’d like to give it a go! You can currently get 20% off your first order at Bloom and Wild by clicking here. Let us know if you try them out!